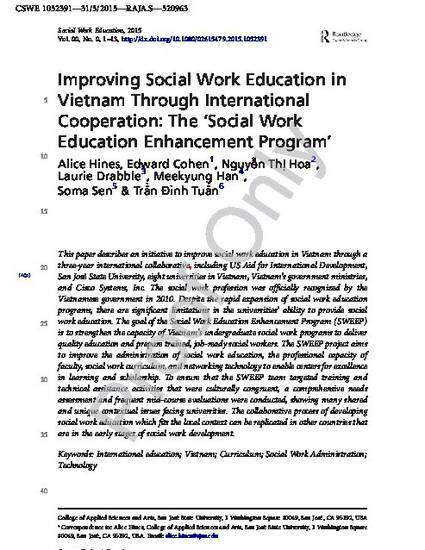 This paper describes an initiative to improve social work education in Vietnam through a three-year international collaborative, including US Aid for International Development, San José State University, eight universities in Vietnam, Vietnam's government ministries, and Cisco Systems, Inc. The social work profession was officially recognized by the Vietnamese government in 2010. Despite the rapid expansion of social work education programs, there are significant limitations in the universities' ability to provide social work education. The goal of the Social Work Education Enhancement Program (SWEEP) is to strengthen the capacity of Vietnam's undergraduate social work programs to deliver quality education and prepare trained, job-ready social workers. The SWEEP project aims to improve the administration of social work education, the professional capacity of faculty, social work curriculum, and networking technology to enable centers for excellence in learning and scholarship. To ensure that the SWEEP team targeted training and technical assistance activities that were culturally congruent, a comprehensive needs assessment and frequent mid-course evaluations were conducted, showing many shared and unique contextual issues facing universities. The collaborative process of developing social work education which fits the local context can be replicated in other countries that are in the early stages of social work development. This is an Author’s Original Manuscript of an article published by Taylor & Francis in Social Work Education on July 3, 2015. The Version of Record is available online at http://www.tandfonline.com/doi/full/10.1080/02615479.2015.1052391.